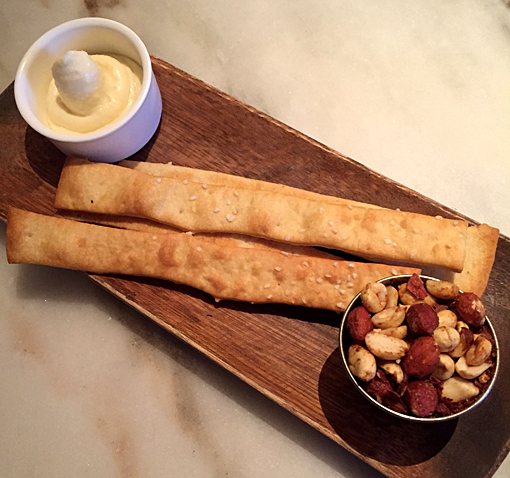 This month Nikki and I visited Bar Margot at Four Seasons, my second visit and Nikki's first! A magical dining experience, evidenced by our three-hour stay! Welcome back to our Top 10 Atlanta Restaurants "By the Numbers", a monthly series by wanderlust ATLANTA and super-popular food Instagramer atlantafoodie! 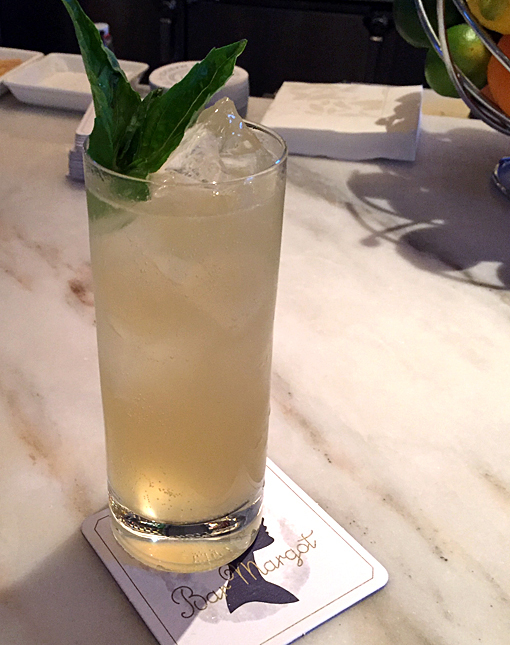 Our fourth stop on this 10-restaurant tour was Bar Margot at Four Seasons, on April 4th (See what we did there? ), a place I hope more Atlantans will make a more frequent special occasion destination, and that visitors to Atlanta will treat themselves to. What we believe is a unique spin on 'Top 10' lists, we're not counting down, but instead we're showcasing some of Atlanta's restaurants with numbers in their names! Some we've been to before and others will be a first-time experience. We're going to make all of them FUN! Top 10 Atlanta Restaurants "By the Numbers"
Nikki jokes that she's not the greatest driver, but somehow manages to beat me to nearly every destination when we're driving separately. I used to think I was traffic savvy, but now I wonder. We usually meet at the bar when we're on one of our "By the Numbers" outings, as we did this time. Being a gin-girl, Nikki started with the Gin Margot, composed of Plymouth gin, lime cordial, amontillado sherry, tonic and Thai basil. She liked it! We'd arrived early so we enjoyed our time at the bar, delightfully entertained by the bartenders, our drinks, people watching, and stimulating conversation. I love that Nikki and I seamlessly navigate morphing conversation topics. We go from cuisine to pop culture to philosophy to travel and back to cuisine in a most eloquent colloquy, of course filled with lots of laughs. The complimentary bar snacks are fantastic! The bread flats and mixed nuts are crowned by the OMG-this-is-so-good beer cheese, featuring Samuel Adams cheese and cream cheese. Since we had made great time getting to the restaurant, we enjoyed a leisurely stay at the bar, grateful for such delicious bar snacks, as well as the precision performance by the lady bartender who waited on us that evening. She makes Tom Cruise in Cocktail look like an amateur! I'd read about Bar Margot's partnership with Absolute Elyx. During the month leading up to the recent Earth Day, every purchase of this specialty cocktail, coupled with a posting and particular hashtag, resulted in a donation of a week's worth of water for someone in need via Water for People. Quite admirable. 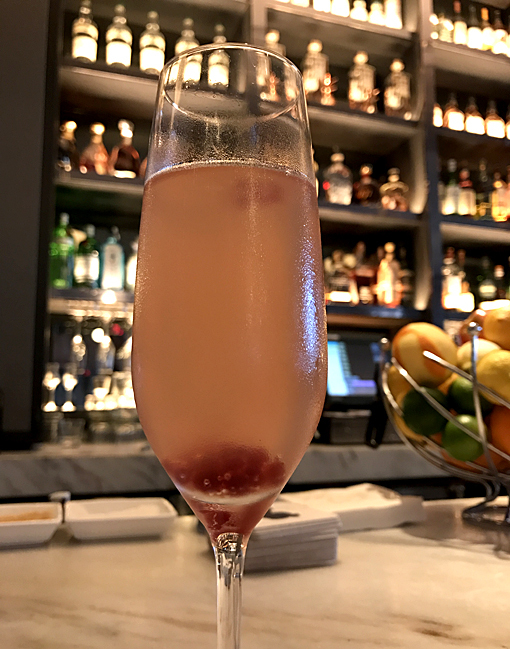 The Royal Antidote--awesome name, by the way--has Absolut Elyx vodka, benedictine, sparkling wine, and pomegranate caviar. It's also a handsome libation. I've had a long-time fascination with molecular gastronomy and love the dining experiences I've had that incorporated it, which haven't been often enough. But, I'd never before had a cocktail that used molecular gastronomy....but I did this night! Caviar is one thing--and I've enjoyed some of the best when visiting Moscow--but "pomegranate caviar", I'd never had. Great fun! Nina, the Supervisor that evening and a wholly delightful person, treated us to an order of the Crab Toast, composed with avocado coulis, rooftop garden herbs and radish. I'd heard about this dish, but hadn't tried it before. I've never really been a crab fan, but "Wow! ", this dish is amazing...surprisingly light and refreshing with delightful flavors. 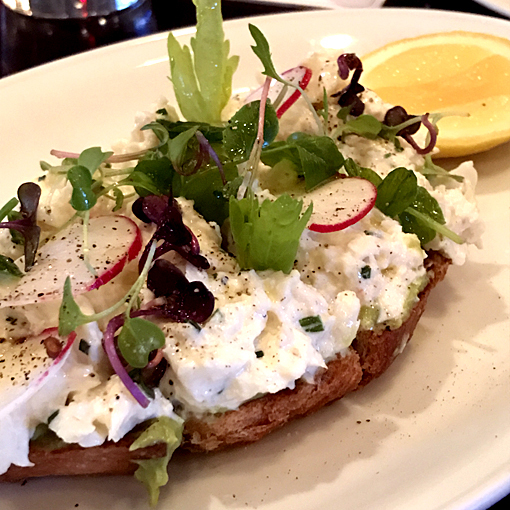 We totally see why it's so popular at Bar Margot. We were seated at a booth situated in the center of the restaurant, the perfect vantage point to observe everything happening in the restaurant--when we weren't totally fixated on the next dish about to capture our full attention. Our server, Rafaet (I think that was his name) was polite, professional, fun, and meticulously attended to our every need and want. Impressive, memorable service. I enjoyed a lovely sauvignon blanc with dinner and Nikki further explored the House Cocktails menu. When she ordered the Lady Victoria--composed of Hangar One vodka, lemon, cocchi americano, and rosemary--Rafaet told us that it and the Gin Margot were the two most popular cocktails on the menu, and standards for quite some time. Nikki evidently has a sense about these things! 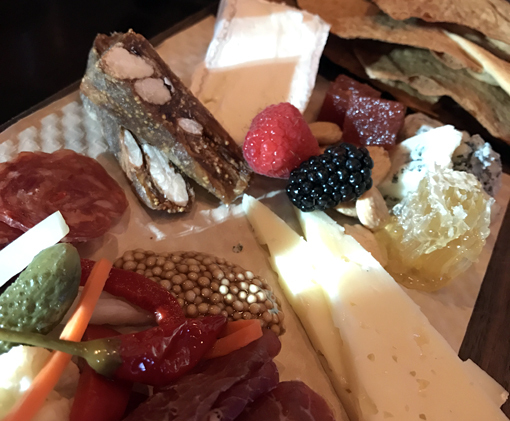 Nikki and I both highly recommend indulging in the Tasting Board, your choice of three each from the Cheese and Charcuterie menus, served with traditional garnishes. 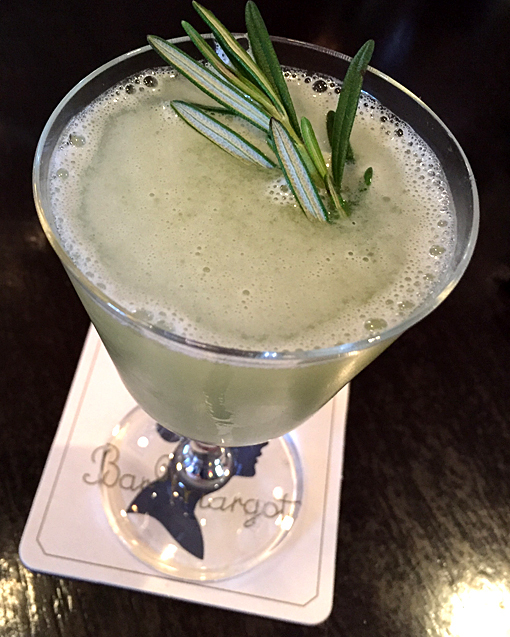 Bar Margot takes "traditional garnishes" to a whole other bountiful level! 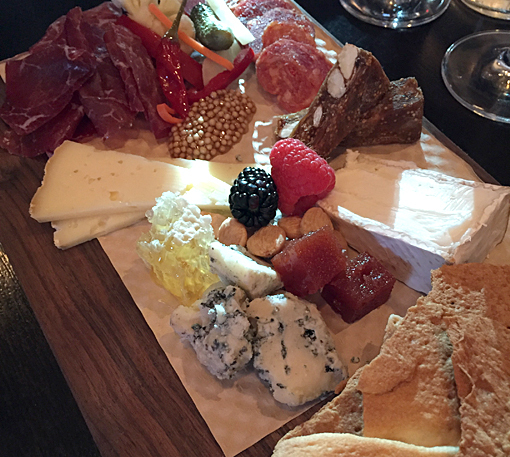 Everything on the board was delicious, but the star of the board--Nikki and I agree--was the Brillat Savarin, a triple crème French cow's milk cheese. It's silky, creamy, buttery, absolutely delicious and is followed by a "Yum!" or "Mmmmm!" after every bite. I want to say it's like brie on steroids, but it's really in a class all its own. We were enjoying the Tasting Board as streams of sunset light etched their way across our table, so we took advantage of the opportunity to make a number of photos, as stealthily as possible, of course. We've enjoyed many conversations about photography lighting since starting "By the Numbers", as well as respective perspectives--you'll notice that the above photo is from the opposite side of the table from the one above it. I have a great time sorting through all the photos after a dining adventure--as does Nikki--reliving the dining experience. We both have histories in photography, but more on that another time. While many restaurants have a "____ of the Day", Bar Margot offerings are so fresh that they're called a "____ of the Moment". 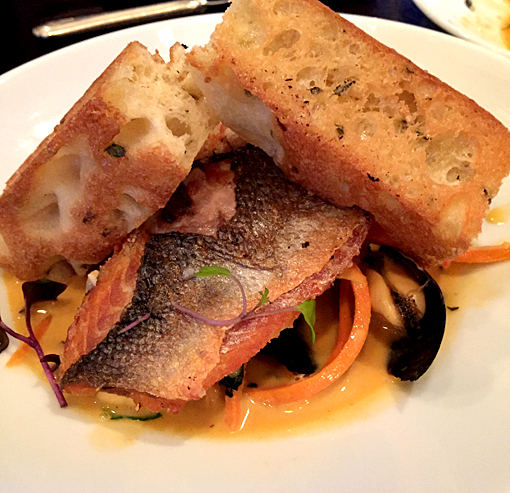 Nikki enjoyed their Fish of the Moment, a branzino (we think...so sorry we didn't make notes this evening) in an amazing broth, mussels, and veggies topped with generous slices of grilled focaccia. I mentioned earlier the rooftop garden greens. Bar Margot is a collaborative effort with Chef Ford Fry and Four Seasons Atlanta Executive Chef Robert Gerstenecker. Chef Robert, who I just found out is no longer with the restaurant, had maintained a chef's garden on the roof of the hotel from which he harvested greens for many of the restaurant's dishes, evidently a continuing practice. I love that! I've never met Chef Ford Fry, but I have met Chef Robert on a number of occasions. He's an unassuming, pleasant and shyly charming person...and a magnificent chef! I've enjoyed his food at industry events, as well as at Park 75, the restaurant--across the atrium--at Four Seasons Atlanta. I don't know who the new executive chef is, or will be, but General Manager Yvette Thomas-Henry says, "Four Seasons Hotel Atlanta is going through an evolution as we selectively align ourselves with people and brands that share our commitment to luxury, service and the local community." I can attest that they're on the right track! 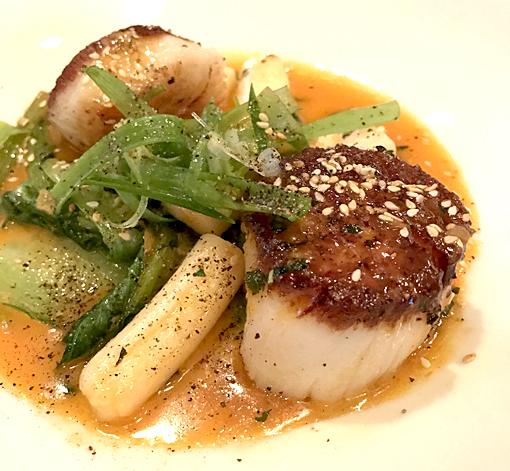 I had the Spicy Scallop Sugo, composed with scallions and toasted sesame. The flavors tickle the entirety of the tongue! Did you learn the "tongue map" when you were a kid? Have you unlearned that bogus myth? Great! Then you know when I say "entirety of the tongue" you know that its deliciousness fills your mouth, with the perfect amount of "kick"...a wholly amazing taste experience! 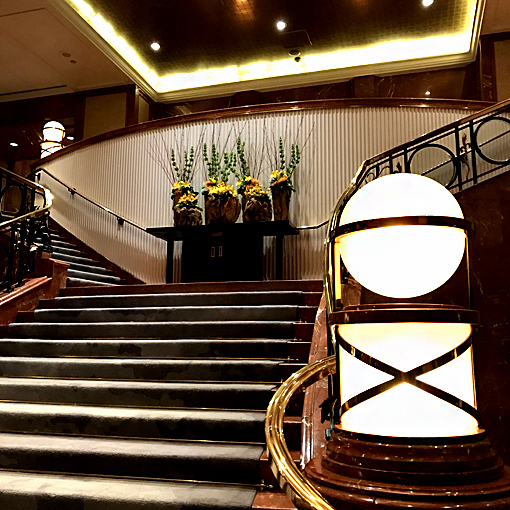 Your wonderful experience at Bar Margot begins as soon as you pull up to the valet stand and increases as you ascend the broad grand staircase to Bar Margot. It's truly a special experience. Bar Margot at Four Seasons is situated in the heart of Atlanta's Arts District. A few of the nearby experiences include the High Museum of Art, Alliance Theatre, Atlanta Symphony Orchestra, Museum of Design Atlanta, Rhodes Hall, Atlanta Botanical Garden, and Piedmont Park. A popular Internet search for Bar Margot is "Bar Margot dress code". I don't see a published dress code, but this is the Four Seasons, so I recommend resort, business or upscale casual attire. Just dress nice and then relax into your visit. Bar Margot will validate your valet ticket...so, what would have been $22 for parking is only $2. That's a sweet deal! Excellent for special occasions or just treating yourself! Bar Margot is in the heart of Midtown, close to a plethora of pre- or post-dining entertainment options. Bar Margot's "Late Nite" menu is as amazing as their lunch and dinner menus. OF NOTE: Bar Margot's former award-winning mixologist, Joe Haywood, was so amazing--I'd read about him and had the pleasure of meeting him during a prior Bar Margot visit--is overseeing all bar operations, cocktail programs and events revolving around One-Ninety, the lobby bar at Four Seasons Hotel Singapore! The bartenders on our visit were amazing, too. Four Seasons obviously only engages superior cocktail talent. Disclaimer: If you live in Atlanta or visit on a regular basis, you know how quickly the Atlanta restaurant scene can change. Our lineup is subject to change based on the Atlanta restaurant landscape over the first 10 months of 2017. Also, all opinions are our own and not at all influenced by the restaurant owners, staff or PR firms, whether we treated ourselves or were hosted by the said restaurant. Thank you for coming along on what we think will be a FUN food journey over 10 months in 2017. Our selection of restaurants is a subjective choice of what we think will be an exciting new way to experience Atlanta restaurants: "By the Numbers". Please, tell your friends and family what we're doing and invite them to also come along for the taste tour! A Little Trouble Is Fun! The Legend of Georgia McBride is Legendary!